Also called the "Old State Prison"
From the Baldwin County Courthouse, go west on Hancock Street for 2 blocks or 0.2 mile (or the one large block containing Georgia College & State Univ.). Turn right on Clarke Street. Go one large block or 0.2 mile. Turn left onto Highway 22 west (Montgomery St.). Go 2.4 miles. Turn right on Highway 212. Go 0.9 mile. Turn left on Meeks (a dirt road). Go 0.4 mile in a straight line to where a residence is on the left and the road appears to end. Take the woods road straight ahead for 0.1 mile. A field road to your right for 100 feet leads to the cemetery. The cemetery will be on your right and left and in front of you under the power line easement and is on the top of a ridge. 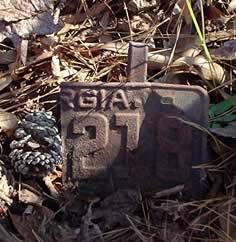 Markers are flat metal plates that are the size of license plates and have grave numbers on them. Historical Background From 1817 to 1874, the State Penitentiary was located in Milledgeville on the grounds of what is now Georgia College & State University. Some of the prison inmates were buried in Milledgeville's Memory Hill Cemetery (known at that time as the City Cemetery). Starting in the early 1870's, Georgia's prisoners were leased out to contractors and the prison in Milledgeville was closed. This leasing system continued until 1912. In 1911, the prison farm that was located on Highway 22 West of Milledgeville opened. The men's' building, which housed up to 600 inmates, was still standing just west of Walter B. Williams Park in 1999. The women's building had been on the south side of Highway 22. It was torn down in the 1940's. The Old State Prison, as it came to be called, operated from 1911 until 1937. Included among the inmates was the famous stagecoach and train robber, Bill Miner, who died in the prison in 1913 and was buried in Memory Hill Cemetery, and Leo Frank, who was abducted from the prison in 1915 and later lynched near Marietta after being wrongly convicted of murdering a fourteen-year-old girl. Georgia's first electric chair was in the Old State Prison on Highway 22. It was built in 1924 by George Edward Barnes of Milledgeville. The first execution in the chair occurred on September 13, 1924, and was 22-year-old Howard Hinton of DeKalb County, whose burial place is unknown. 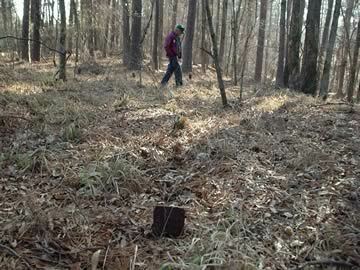 One of the youngest persons executed in Georgia, 16-year-old Eddie Marsh, was put to death February 9, 1932, for the murder of a Dougherty County pecan grower and is buried in an unmarked grave in this cemetery. By the time the prison closed in 1937, after being moved to Reidsville, 162 convicts had been executed in the chair. The electric chair is now on display at the Reidsville facility. There are no markers with names in this cemetery. Those graves that are marked have only numbers on metal license plates. Grave number possibly 296. All info per his death certificate, as described by Christy Wheeler. Grave 110. per Patrick Glendon McCullough, gg-grandson.